Gheiby, Abolhasan, Azadi, Majid. (1394). Classification of hydrometeors using microwave brightness temperature data from AMSU-B over Iran. مجله ژئوفیزیک ایران, 9(5), 24-39. Abolhasan Gheiby; Majid Azadi. "Classification of hydrometeors using microwave brightness temperature data from AMSU-B over Iran". 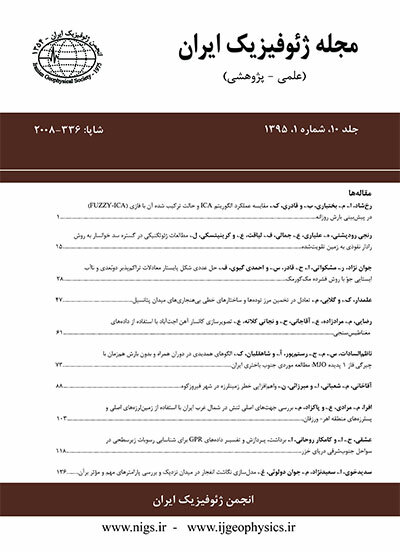 مجله ژئوفیزیک ایران, 9, 5, 1394, 24-39. Gheiby, Abolhasan, Azadi, Majid. (1394). 'Classification of hydrometeors using microwave brightness temperature data from AMSU-B over Iran', مجله ژئوفیزیک ایران, 9(5), pp. 24-39. Gheiby, Abolhasan, Azadi, Majid. Classification of hydrometeors using microwave brightness temperature data from AMSU-B over Iran. مجله ژئوفیزیک ایران, 1394; 9(5): 24-39. The Advanced Microwave Sounding Unit-B (AMSU-B) installed on the NOAA-15, 16, and 17 satellites, is the new generation of a series of microwave imagers/sounders that can sense atmospheric moisture and other hydrometeors through clouds. This paper demonstrates the potential of multi-frequency AMSU-B data for classifying different types of hydrometeors. Ten types of these hydrometers have been collected using meteorological data (synoptic reports, radiosonde data and infrared and water vapor images) over Iran. Co-located AMSU-B data were used to perform a quantitative classification of the hydrometers. Three main classes including heavy precipitating, moderate precipitating, and non-precipitating hydrometeors were found based on the multi-frequency brightness temperature signatures. The distinguishing criteria for this type of analysis are: (a) brightness temperature (BT) at 89 GHz frequency, (b) slopes of the BT between 89 and 150 GHz, and (c) crossover of BT curves between 89 and 183 GHz frequencies. S. Q. Kidder, M. D. Goldberg, R. M. Zehr, M.Demana, T. F. Purdom, C. S. Velden, N. Grody, S. J. Kusselson, Satellite analysis of tropical cyclones using the advanced microwave sounding unit (AMSU), Bult. Amer. Meteor. Soc., 81(2000) 1241-1259. G. Liu, J. A. Curry, Large-scale cloud features during January 1993 in the North Atlantic Ocean as determined from SSM/I and SSM/T2, J. Geophys. Res., 101(1996) 7019-7032. G. Liu, J. A. Curry, Precipitation characteristics in Greenland-Iceland-Norwegian Seas determined by using satellite microwave data, J. Geophys. Res., 102(1997) 13987-13997. J. L. Schools., J. A. Weinman, G. D. Alexander, R. E. Stewart, L. J. Angus, C. L. Lee, Microwave properties of frozen precipitation around a North Atlantic Cyclone, J. Appl. Meteor., 38(1999) 29-43. M. Katsumata, H. Uyeda, K. Iwanami, G. Liu, The response of 36 and 89GHz microwave channels to convective snow clouds over Ocean: observation and modeling, J. Appl. Meteor., 39(2000) 2322-2335. R. Bennartz and G. W. Petty, The sensitivity of microwave remote sensing observations of precipitation to ice particle size distribution, J. Appl. Meteor., 40(2001) 345-364. J. R. Wang, J. Zhan, P. Racette, Storm-associated microwave radiometric signatures in the frequency range of 90-220 GHz, J. Atmos. Oceanic Technology, 14(1997) 13-31. R. W. Saunders, T. J. Hewison, S. J. Stringer, N. C. Atkinson, The radiometric characterization of AMSU-B, IEEE. Trans. On Microwave Theory and Techniques, 43(1995) 760-771. R. Ferraro, F. Weng, N. C. Grody, L. Zhao, Precipitation characteristics over and from the NOAA-15 AMSU sensor, Geophys. Res. Letter, 27(2000) 2669-2672. N. C. Grody, J. Zhao, R. Ferraro, F. Weng, and R. Boers, Determination of perceptible water and cloud liquid water over Ocean from NOAA 15 advanced microwave sounding unit, J. Geophys. Res., 106(2001) 2943-2953. D. H. Staelin, F. W. Chen, Precipitation observation near 54 and 183 GHz using the NOAA-15 satellite, IEEE Trans. on geosciences and remote sensing, 38(2000) 2322-2332. B. M. Muller, E. F. Henry, X. Xiang, 1994: Simulations of the effects of water vapor, Cloud liquid water, and ice on AMSU moistures channel brightness temperatures. J. Appl. Meteorol., 33(1994) 1133-1154.